Welcome to the second section of Chapter One of Naturally Healthy Skin by Stephanie Tourles. The papillary binds the epidermis and dermis together. Papillae are the ridge-like projections that make up your finger prints. Containing capillaries and nerve ends, the papillae are super-sensitive to touch stimuli. The reticular layer is made of elastic mesh-like fibers that give skin its resilience. But as we age, this layer’s strength and tone diminishes, collagen formation slows, and wrinkles begin. 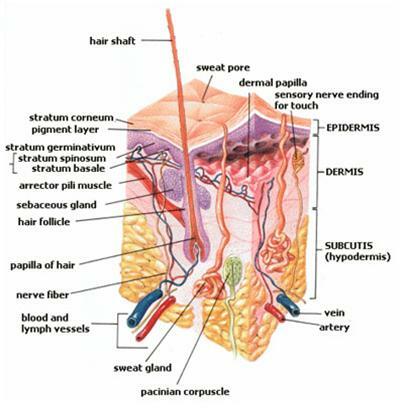 This layer contains fat cells, blood and lymph vessels, oil and sweat glands, arrector pili muscles, and hair follicles. Subcutaneous means ‘beneath the skin’. A fatty layer connects the dermis to the underlying muscle tissue. This fatty layer is a shock absorber, insulator protecting our internal organs and gives your skin a smooth, strong foundation. The photograph below shows the skin layers discussed above. Skin structure, its function will be discussed in my next blog.